Below are our handrail subsections, organized by material option. 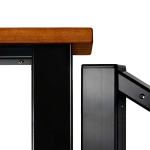 Note that the aluminum handrail can also be used for supporting a wood top rail. Handrails provide guidance and support, offering a surface for your hand to run along and grip. They are required for stairs and other angled runs, but can be added to any section of any system where a graspable rail is desired. Top rails can function as handrails if they are at the right height, but this isn’t always the case. Choose the appropriate options for your project. Cable Railing Direct offers aluminum and round stainless steel handrails using the same colors and materials as our top rails and posts. We also offer compatible brackets, mounts, and other components, allowing for a variety of potential handrail applications and uses. Our ALUMINUM POST-TO-POST INLINE RAIL can be used as a standalone handrail or as support for a wood top rail. 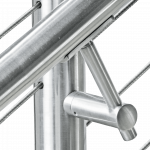 Our STAINLESS STEEL HANDRAIL COMPONENTS are available in two sizes. Choose 2” diameter to perfectly match our stainless steel top rails and posts, or go with our Handrail-Exclusive 1.5” diameter option, which offers a slighter rail for both practical and visual appeal. If you have any questions, or would like design and ordering advice, give us a call any time at (855) 820-8439.